Could We Build 'Star Trek's' Starship Enterprise? Since its first appearance on the original "Star Trek" series in 1966, the starship Enterprise has become a symbol for space travel. 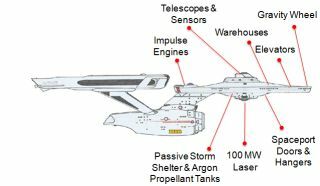 Recently, an anonymous engineerclaimed that an approximation of this iconic ship could be built in the next two decades. But just how close is mankind to zipping through the stars at warp speed? On the website BuildTheEnterprise.org, a self-proclaimed engineer who identifies himself only as "BTE-Dan" suggests that a working facsimile of the iconic ship could be built and launched over the next 20 to 30 years. The ship would require a few modifications, but would look a great deal like Captain Kirk's famous ship. Built in space, the ship would never visit the surface of any moon or planet, and so would never need to reach the high speeds necessary to escape surface gravity. The engines would be powered by nuclear reactors onboard the ship, and use argon rather than xenon for propellant, saving a few hundred billion dollars in cost. As an added bonus, BTE-Dan notes that argon can be mined from the atmosphere of Mars. The entire ship would be more than 3,000 feet (almost 1 kilometer) long, with its central disk making up nearly half its length. According to the website, much of the technology needed to build the ship described is within our grasp, including the rotating gravity wheel, which could be suspended by electromagnets within a vacuum to eliminate mechanical wear and tear. Also easily within reach, he claims, are a 1.5 GWe (gigawatt electrical) nuclear reactor safe to carry in a spacecraft, and composite materials that would save mass, add strength and improve radiation shielding. BTE-Dan describes himself as a systems and electrical engineer who has spent the past 30 years employed at a Fortune 500 company. He is presently declining interviews. Though the prospect of a real-life Enterprise is appealing, the proposed ship is not without problems. Adam Crowl, an engineer with Icarus Interstellar Inc., a nonprofit foundation dedicated to interstellar exploration, pointed out that a spaceship built with a sufficiently powerful nuclear reactor would need large thermal radiators, ruining the classic Enterprise look. "Engineering physics doesn't respect our aesthetics," he told SPACE.com by email. BTE-Dan's ship is essentially an iconic replica of the famous starship, and may not be practical. "I would love to see 1,000 people go to Mars, but I need convincing that they need to be on the Enterprise to do so," said Crowl. Other engineers said the similarities between BTE-Dan's ship and the Enterprise are only skin-deep. "He wants to build something using foreseeable technology that just looks like the Enterprise," said Marc Millis, an aerospace engineer at NASA's Glenn Research Center. "It's nowhere close to being what the Enterprise is." Still, the site received so many visits soon after its launch that it crashed, revealing how appealing the idea is to many people. Though some aspects of the Enterprise are far out of reach today, many are within our grasp, and some are part of our daily lives. Sliding doors, futuristic in the 1960s, now welcome almost every grocery store visitor, and today's flip-open cellphones resemble Star Trek's tricorders. The touch-screen devices ubiquitous today even look like those used in the 1990s episodes of "Star Trek: The Next Generation." "If you had shown someone an iPad in the 1990s and told them it was 23rd century technology, they would have believed you," Richard Obousy, co-founder and president of Icarus Interstellar Inc., told SPACE.com. Advances with 3D printers also provide opportunities for voyages through space, allowing the replication of parts while using materials found at the destination. Andreas Hein, an aerospace engineer also with Icarus Interstellar, suggested that it might not be long before such printers make food similar to the way meals were synthesized by replicators on the Enterprise. Additionally, engineers working at NASA's Advanced Propulsion Physics Laboratory, informally known as Eagleworks, are working on a Q-thruster that bears a striking resemblance to the impulse engines on the Enterprise. Millis suggested the next step in rocket propulsion will likely include utilizing a nuclear power source, an option that is stymied by the Nuclear Test Ban Treaty. He acknowledged that the barriers aren't just political ones, as people are nervous about the idea of launching nuclear rockets from Earth's surface, despite the fact that it could be done safely. "In terms of propulsion technology, fusion engines are potentially within a generation or two," Obousy said, though he added that sudden technological jumps could accelerate the process. Visiting a planet without being seen may also be not too far out of reach. "We're doing things with meta-materials that'll allow practical cloaking, maybe even invisibility," Crowl said. Gravity presents one of the greatest challenges: The Enterprise of television and the movies lacks a gravity wheel, instead utilizing synthetic gravity. According to Millis, if we could find a way to master gravitational forces, such technology could also be utilized in tractor beams or the ship's propulsion. "Star Trek"-like propulsion remains a key problem. Fans are familiar with the warp drive, which accelerated the ship faster than the speed of light and allowed its crew to zip between stars. Such travel defies our present understanding of physics. "I think this is one of the most important aspects that prevents an Enterprise-type ship in the near future," Hein said. Obousy agreed. "One of the staples of these warp drives is that they require an exotic form of energy that we have not been able to create in the labs, dark energy being the salient example," he said. Dark energy is the unexplained force behind the accelerated expansion of the universe. Scientists don't yet understand what it is, which makes it a challenge to use in propulsion. A warp drive would require an enormous amount of energy. Theoretical calculations using dark energy to move a starship would require more energy than that contained within the planet Jupiter, making it uneconomical. In the "Star Trek" universe, the warp drive relied on antimatter. When matter and antimatter annihilate one another, the energy produced is immense. Though such an energy source could conceivably power the ship, it is available only briefly. Crowl pointed out that antimatter technology itself is developing rapidly. Ultra-high intensity lasers may soon allow it to be directly created from energy, and useful amounts may be trapped in the magnetic fields of planets like Earth and Saturn. But, like dark energy, antimatter may prove to be more trouble than it's worth. "Using antimatter right now is very expensive," Millis said. "But that doesn't mean that it always will be." When mankind finally travels to the stars, we may have to forgo warp speed for something else, such as the manipulation of space-time itself. According to Albert Einstein, nothing in the universe can travel faster than the speed of light. But Millis points out that such limits do not necessarily apply to space-time. Theories in peer-reviewed journals explore the possibility of surrounding a craft with a bubble of space-time that expands and contracts, perhaps allowing it to exceed the speed of light. Another potential challenge to recreating the "Star Trek" universe is the system of matter transmission. The crew often traveled to a planet by transporter, beaming from the Enterprise directly to the surface by way of machines that could scan a body, atom-by-atom, and then recreate it in another place. Recent advances have been made in quantum teleportation, but Obousy and Millis both stressed the difference from "Star Trek"-style travel. In quantum teleportation, "it's not the same photon you started out with, but a replica," said Obousy. Such travel would require enormous precision. "If you were going to recreate a human being transported from one place to another, you'd want to make sure everything's in the exact place," he said. Millis suggested that, rather than matter transmission, scientists might one day learn how to utilize very small wormholes for travel. "Of course, if you put mass through it, it might make the wormhole collapse," he noted. Ultimately, the greatest challenge to replicating the Star Trek journeys may not come from the technological front. "One of the things that I really liked about watching [the show] was the very good behavior of the crew," Millis said. "The prejudices and petty human differences that make up so much of television are pretty much absent. When I think about relative impossibilities, I think it will be easier to make technology for the starship Enterprise than to finally make humans behave that honorably." Visit www.buildtheenterprise.org to see more details on the proposed construction of a real-life Enterprise.